We have just finished building the spectacular Ocean Spray garden for the RHS Hampton Court Palace Flower Show 2014. This included the construction of a cranberry filled pond. You can see an amazing time-lapse video below of how we built it. 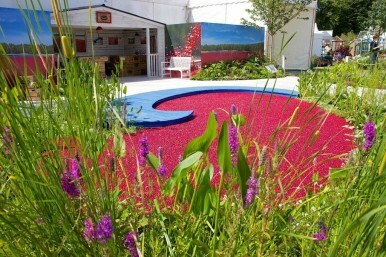 The garden was designed by Charlotte Murrell for Ocean Spray. It is a celebration of the picturesque wetland home of cranberries, and has been designed to bring the fascinating story of these vibrant berries to life. Its timber decking path has signage to explain how the pick of the cranberry crop makes it from the farm, where a crimson tide of berries undergo a wet harvest, to tables around the world.